COLORADO SPRINGS – The 2019 COS Racing Team Social/Kickoff meeting will take place on Oct. 20 from 6-8pm in High Forest Ranch. This meeting is open to all interested cyclists, both current and future. This is our annual registration event, team meeting, and fall social event. It will include team sign-up, kit fitting, and a brief presentation by our team President on this year’s and last year’s activities. 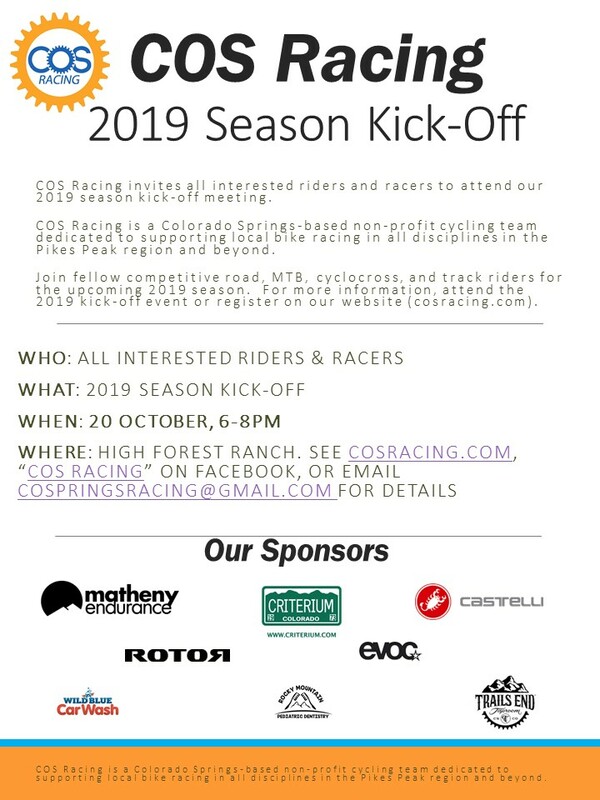 If you are interested in joining COS Racing, please join us at High Forest Ranch to learn about the team, meet other team members, and try on this year’s team kit. One-time gate code is Gate Code: #5103 (must hit # first). We look forward to seeing you on the 20th. Food will be provided.